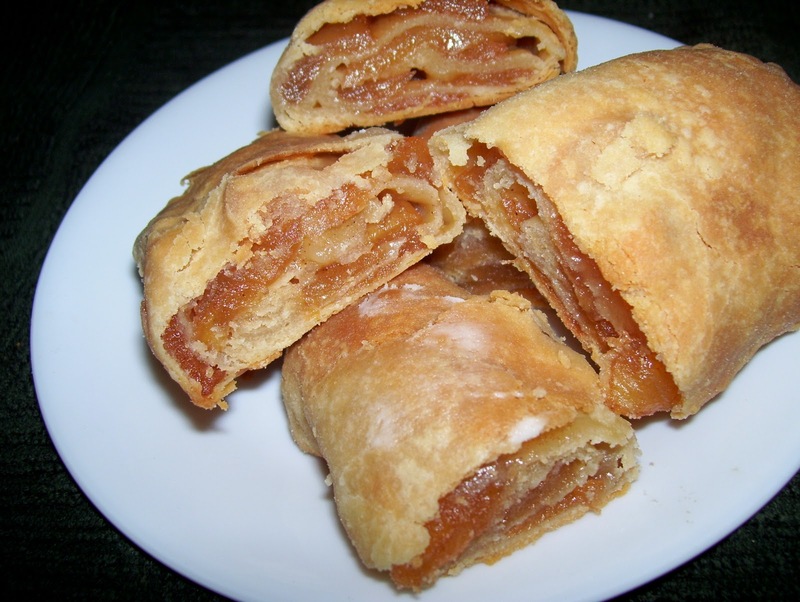 The first time my dad brought apple strudel home from the bakery, I thought it was one of the best things I had ever tasted. I loved the paper-thin pastry layers and the sweet apple filling. Strudel was actually hard to find in our small town and when it was available, people bought it up quickly. If my dad did not get out early on a Saturday morning, whatever strudel had been for sale would be long gone. My mother told us about the pastries that she ate in Europe during and after WWII. Strudel was made in many countries, including Germany, where she and my dad met. I know that my mother never made this delicate pastry...according to her, strudel making was an art and she just did not have the patience to go through all the steps it took to create that amazing flaky pastry. I hate to admit that I have shied away from making strudel...too much work and all that but, I did test out the recipe for the pastry rolls detailed below. The buttery crust is flaky and light and the apple filling is wonderful. This pastry has three steps, reminds me of strudel and is a wonderful dessert or breakfast pastry. The dough could be held overnight and rolled, filled and baked the next morning...what a treat for a lucky family! 1. In a medium bowl, combine butter, cream cheese, and egg yolk; beat until smooth. Add flour and mix well. Form into a ball, cover and refrigerate. 2. In a saucepan, add apples sugar and cinnamon; mix well. Cover and simmer over low heat until apples are tender. Juice will form as the apples cook down. Do not let apples burn. When apples are cooked, remove from heat and allow to cool completely. Remove apples from a slotted spoon, leaving juices in saucepan. 3. Remove dough from refrigerator and divide evenly into three pieces. Roll each into a ball and flatten them. Roll one portion of dough on a floured board into a 10x13 inch rectangle. Place 1/3 of the apple mixture evenly over the rectangle. Starting at a short end, roll the dough carefully toward the other short end. Lift roll and place, seam-side down in a greased baking pan; tuck ends under. 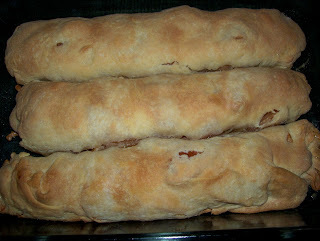 Continue process with remaining dough and apples. Bake at 375 degrees for 40 minutes or until brown. Lightly tent with foil if top starts to over-brown. Cut each roll into 5 or 6 pieces, each. Serve warm or cover and refrigerate for later use.